Call Us Today! 907-854-0963|FREE Shipping! Handpicked by me personally, dried and properly stored until time of sale. Chaga Mushroom has been found to contain over 215 phytonutrients — plant chemicals which are non-nutritive with protective and disease-preventing properties. Laboratory and animal studies show that chaga can inhibit cancer progression. Studies in humans are needed. Laboratory and animal studies show that chaga can activate some types of immune cells. Studies in humans are needed. Laboratory and animal studies suggest anti-inflammatory effects. A small study in humans also suggested a reduction in markers related to inflammation. Additional clinical trials for this use are needed. Although protective effects have been reported, these benefits have not yet been studied or confirmed. Chaga mushroom is found in Alaska and Russia and has been used in folk medicine for various ailments. Laboratory and animal studies show that compounds in chaga can kill cancer cells selectively and stimulate the immune system. It may also have benefits such as reductions in fatigue and inflammation, as well as increased mental sharpness. In addition, chaga may interact with some drugs and is high in oxalates, which may prevent the absorption of some nutrients and can be toxic in high doses. When a food is measured for antioxidant potential, it is measured on a scale known as Oxygen Radical Absorbance Capacity (ORAC). While the Chaga Mushroom is obtained through much of the United States, Alaskan Chaga has higher potential levels of antioxidants compared to that which is found in the Lower 48. Phytonutrients: The Siberian Chaga Mushroom has been found to contain over 215 phytonutrients – plant chemicals which are non-nutritive with protective and disease-preventing properties. The World Trade Organization has classified as a Medicinal Mushroom while it has also been approved by the U.S.F.D.A. as safe for “Food” Use/Supplement. The prime phytonutrient found in Chaga is betulinic acid which has been shown to have anti-retroviral, anti-malarial, and anti-inflammatory properties as well as recently discovered anti-cancer properties. Other useful phytonutients present in Chaga include: 29 Beta Glucans, Saponins, SOD (superoxide dismutase), amino acids, Germanium, Triterpenes, organic minerals, polysaccharides and Triterpenes. There are also many important vitamins and minerals contained within the Chaga mushroom. 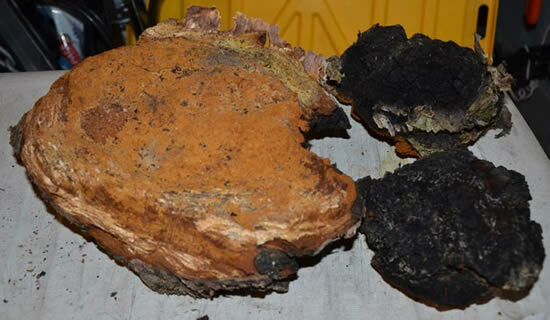 Chaga Consumption: The Chaga mushroom is typically consumed in two different ways. Since its texture is hard and woody, it cannot be eaten like many other mushrooms found in the grocery store. Also, heat is needed to release the beneficial chemicals from the chitin that makes up the cellular walls of the mushroom. The first, most common method is to make a tea from the ground Chaga. In fact, Chaga tea has been consumed by Siberians and Russians since the 16th century! 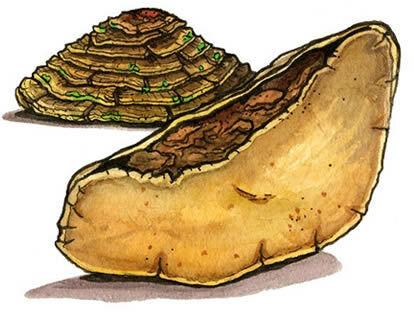 Phellinus linteus mushrooms, is a medicinal mushroom used in Japan, Korea and China for centuries to prevent ailments as diverse as gastroenteric dysfunction, diarrhea, haemorrhage and cancers. P. linteus is used to prevent aging, and specifically to eliminate or prevent wrinkles, but research evidence is lacking. P. linteus has been shown in some lab studies to inhibit tumor growth. A few cases of regression of liver and prostate cancer have been reported, but such observations need to be confirmed in clinical studies. 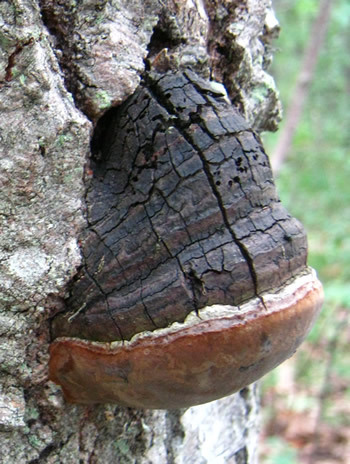 Phellinus linteus, a medicinal mushroom, showed anticancer effects in lab studies. Clinical trials are needed to establish its anticancer potential. P. linteus is a medicinal mushroom used in traditional medicine in Asia. Compounds present in this mushroom have anti-inflammatory and antitumor properties. Large-scale studies are needed to confirm these effects. In Korea the mushroom is made into a tea and drunk on a regular basis. In the Asian countries, they have used the mushroom for hundreds of years to treat diarrhoea, gastroenteric dysfunction, haemorrhage, cancers and other ailments. The mushroom is also said to boost the body’s immune system. This is due to the presence of Beta D-Glutan and Lectin. These two polysaccharide-protein complexes possess properties that control the immune system. It is also hailed as having properties that can regulate blood sugar levels. This follows the discovery of a compound known as interfungins A. In short, it is highly beneficial for diabetics to incorporate this mushroom in their diet. It is particularly helpful in controlling Type 2 diabetes. In treating haemorrhage, the mushroom controls bleeding in ovaries and excessive bleeding during menses. It also stops intestinal bleeding. 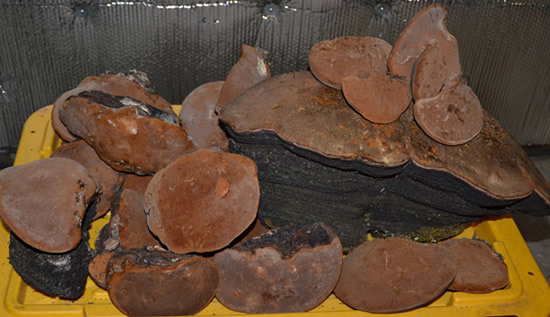 Research is currently underway to determine if Phellinus Linteus can control haemophilia. Should the findings be confirmed, it would be a great breakthrough in the medical field. Haemophilia is a genetic disorder that inhibits normal blood clotting. When someone gets a cut, the open part bleeds for a while as the body initiates the clotting process. Then bleeding stops and the body begins to repair the broken cells. In cases of haemophilia, bleeding continues unabated which can be fatal. How to dry Chaga, How to store Chaga, How to find Chaga, When to Harvest Chaga, What trees do chaga grow on?